All institutions of higher education share common goals, such as attracting the right students, aligning resources with organizational goals, and maximizing student retention and graduation rates. To achieve these goals, progressive universities and colleges are already implementing data integration, data visualization and advanced analytics solutions across the student life cycle. 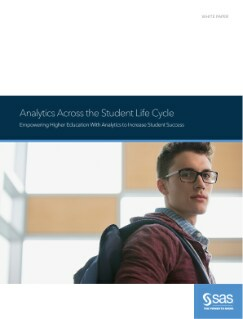 This paper explores how these solutions empower decision makers and shares best practices that are fundamental to the successful application of analytics across the student life cycle. It also provides examples and case studies of how higher education institutions are already using predictive analytics and data visualizations to optimize key phases of the student life cycle.